Teenage Mutant Ninja Turtles is an animated cartoon series that follows the adventures of four crime fighters who happen to be humanoid turtles that are extremely talented in martial arts. The turtles are named Donatello, Michelangelo, Leonardo and Raphael. The backstory surrounding the heroes in a half shell is that four baby turtles were accidentally dropped into the sewers and were exposed to some high-powered nuclear goo that morphed them into half-human, half-turtles with super strength. They were taking in as babies by a wise sewer rat named Splinter who cared for the turtles as they grew and trained them in ninjutsu. The idea for Teenage Mutant Ninja Turtles was hatched in a series of comic books. The comic book series became quite popular with children, and the the animated series was created and released to coincide with the marketing of a popular line of action figures. 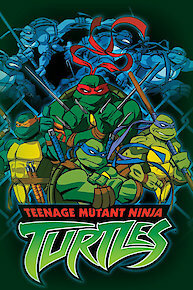 The Teenage Mutant Ninja Turtles program was created and aired first as a five-part miniseries before being produced as a weekly Saturday morning cartoon. The show was then offered for syndication to air five episodes a week. The animated show would usually focus around a battle with a villain attempting to harm the city. The Turtles were guided through their adventures by Splinter, who also acts as their sensei. The villains that they would do battle with varied each episode but some of their biggest rivals included Shredder, a large disgraced ninja who trained with Splinter but was exiled by his sensei for his violent temper and erratic behavior. Shredder took his commands from Krang, a super-intelligent disembodied brain who is Shredder's commander. Shredder had two bumbling henchman that he would often send into battle, Beebop and Rocksteady. They were very strong but clumsy and were used as a comic relief. April O'Neil is a television reporter who uncovers the story of the turtles and helps them out in their battles. While Raphael, Michelangelo, Donatello & Carter work on restoring Leonardo to his regular self, Mung steals all the plutonium from a power plant in order for Dregg to build a Plutonium Ray to turn Leonardo into a radioactive killer. Will Arnett joins the cast as a "secret" character in this not-much-anticipated remake. Megan Fox is set to star in Michael Bay's 'Teenage Mutant Ninja Turtles' remake. Does this mean Bay and Fox have patched things up? Teenage Mutant Ninja Turtles is currently available to watch and stream on The CW. You can also buy, rent Teenage Mutant Ninja Turtles on demand at Hulu, Vudu, Sling, FandangoNow, Google Play, iTunes online.